YOKOHAMA, Japan (October 17, 2012) - Nissan Motor Co., Ltd. today unveiled the world's first steering technology that allows independent control of a vehicle's tire angle and steering inputs. This next-generation steering technology was developed by Nissan. A conventional steering system directs tire movements by transmitting steering inputs to the tires via a mechanical link. Nissan's next-generation steering technology reads the driver's intentions from steering inputs and controls the vehicle's tire movements via electronic signals. This transmits the driver's intentions to the wheels even faster than a mechanical system and increases the direct driving performance feel by quickly and intelligently communicating road surface feedback to the driver. The system controls and insulates the vehicle from unnecessary road-generated disturbances to deliver only the necessary performance feel to the driver. For example, even on a road surface with minor ridges or furrows, the driver no longer has to grip the steering wheel tightly and make detailed adjustments, so traveling on the intended path becomes easier. Accompanying this next-generation steering technology, Nissan has also developed a camera-based straight-line stability system to further enhance on-center driving capability. This system is a world-first*2 technology that improves vehicle stability by making small input angle adjustments so the vehicle will accurately trace and continue as planned in the lane it is traveling. If the vehicle direction changes due to road surface or crosswinds, the system acts to minimize the effect of these conditions resulting in reduced steering input from the driver. Using a camera mounted above the vehicle's rearview mirror, the system analyzes the road ahead, recognizes the lane direction, detects changes in the vehicle's direction, and transmits this information to multiple electronic control units as electronic signals. If a discrepancy occurs, the system acts to reduce the discrepancy by controlling the opposing force to the tire angle. By reducing the frequency of detailed steering input adjustments, which are a cause of fatigue on long drives, the driver's workload is greatly reduced. This next-generation steering technology's high reliability is achieved by multiple ECUs. In the event a single ECU malfunctions, another ECU will instantly take control, and in extreme circumstances such as the power supply being disrupted, the backup clutch will act to connect the steering wheel and wheels mechanically, ensuring continued safe travel. This technology will be equipped on select Infiniti models on sale within one year to provide "Driving as Intended" and "Driving with Peace of Mind" for owners. *1: World-first development of an independent control steering technology that controls tire and steering angles inputs independently. *2: World-first development of an accurate tracing technology that enables a driver to continue driving as planned in the lane with small steering angle adjustments (depending on road conditions). Marshall Motor Group continues on its acquisition trail, but of equal importance to chief executive Daksh Gupta are the controls and processes in place at the group to meet the challenges and maximise the opportunities, including the development of the company’s rapidly increasing staff. Jeremy Bennett: What are your strategic plans? Daksh Gupta: Our strategic imperatives are around optimising the performance of our existing core businesses with a focus on customer service, our people, brand partnerships and operational excellence. The second part is the acquisition side, which is about balancing our brand portfolio and part of that is about keeping good pace with the market. Also it’s about optimising our cash management around work and people issues. It’s a case of building on reputation for values in business. JB: What are the headline numbers? DG: Our operating profit went backwards, from £10.2 million to £6.9m on a like-for-like basis on a turnover of more than £700m. 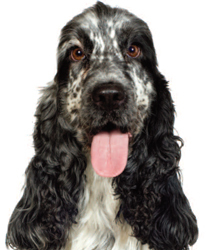 In 2010 we achieved £581m turnover, and we made £9.9m operating profit. But within that we took some exceptional hits, part of which was £1.6m related to acquired sites, business restructuring and divesting of businesses. JB: When you buy an underperforming business there’s a price that you pay because it’s failing. It costs you to drag it up. DG: This year we’ll break even on the new businesses. Next year we’ll make half a million and the year after that a million on them as the impact of our turnaround policy is felt. JB: What were the other reasons for the fall in profits? DG: We are heavily concentrated with a number of Japanese brands (Marshalls is Honda’s biggest partner with seven franchised outlets) and the tsunami had a comparatively worse effect on our portfolio compared to groups with less representation of Japanese brands. The good news is we did outperform the 19% national decrease as we were down only 12%. But if you take 12% out of a £700m business it’s going to hurt. DG: One of the challenges we face is that since our volumes were down last year we’re not going to see those customers this year for servicing, so there’s a whole host of stuff that we need to do to make sure that we’re maximising every aftersales opportunity. JB: What are you going to do to improve your absorption rate of 72% in extremely challenging conditions? DG: We’re concentrating on everything around aftersales mar-keting, making sure we’ve got the right resource in terms of divisional help. We’re recruiting two divisional aftersales guys and plan to increase this to five.They’re effectively a resource employed by the group or by each division to support the service managers, helping them drive the performance. One of the things we do is track electronic vehicle health check activity on a weekly basis. Had we not done this I don’t think we’d have achieved 72% absorption. We were in the 80s, but clearly the decline in retail volumes has hit that. JB: You’ve added Kia, Mercedes-Benz and boosted your representation with Honda and Jaguar. Why? DG: Over the last three or four years we’ve been doing deals that have added brands or have been divesting of brands to the point where we now have fewer partners. We have to work in scalable markets and if we’ve divested from certain brands it’s invariably because they’ve been loss-making, a business where structurally we’re just not going to make money; or it’s not been a core brand for us. JB: Have you now got your core brands? DG: We’re not quite there yet. There are a couple of brands that we would love to represent, but we also have to recognise that those opportunities come up very rarely. Our strategy on brand is based on growing scale. JB: You’ve moved out of your East Anglia heartland. Can you focus on more than one region and still be successful? DG: The scale of change in Marshall Motor Group is enormous. In 2008 we were very much a regional group. And if I was asked to describe the strategy it was ‘dominate a region’. That was fine for a period of time, pre-financial crisis when the market was 2.4m new cars. You could guarantee a return because the volumes were significantly higher and absorption was higher. But the world has dramatically changed since then with a smaller market and the additional power of the internet. JB: Your response has been to move to the north-east and north-west. DG: Those areas are where I can achieve scale. You have to consider that whatever the size of the market area you’re in, a certain amount of the cost burden will be the same for me as it would an owner operator. But if you could operate in a city market the opportunity could be three times the size, your cost base will be nowhere near the same ratio as three times the opportunity. In 2008 our average turnover per site was £9m. This year we’re forecasting £13.5m. That’s a function of two things: one, we’ve sold more through our existing operations. Secondly, it’s the result of operating in bigger markets. Between 2009 and today we have added 33 new businesses and all have been broadly out of our traditional heartland, extending our reach into the north-west with our five Mercedes-Benz and two Smart dealerships; into Yorkshire adding four further Honda businesses; into Buckinghamshire, with the acquisition of Pilling Group; into Leicestershire with the Francis Group; opening businesses in places like Nottinghamshire. But in those three years we have also been divesting of brands. We started with 41 businesses, we’ve added 33, but divested of 13 businesses, so our total is now 61. Our brand portfolio has reduced from 28 to 19. The Marshall Family Day to be held at The Plough in Fen Ditton in Cambridge on Saturday 29th September from 12 - 6pm. 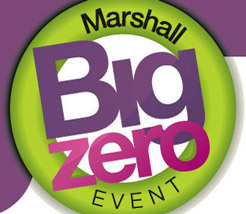 The Plough will be offering a BBQ as well as their normal offerings and The Marshall Network will be holding a charity dog show for Marshall employees to bring their K-9 friends along! There will also be a bouncy castle for the children! The Network will also be extending the Photo Competition so that the judging will coincide with the dog show; we hope that you will bring the entrants along, to claim their prizes!! Everyone is welcome, we hope to see you all there to support Guide Dogs for the Blind and the Marshall Group of Companies. Peter Cakebread, managing director of Marshall Leasing has just been appointed Vice-Chairman of the British Vehicle Rental & Leasing Association (BVRLA) and will take over as Chairman of the BVRLA in May 2013, a position he will then hold for two years until 2015. The BVRLA is the UK trade body for companies engaged in the leasing and rental of cars and commercial vehicles. Its members provide shortterm rental, contract hire and fleet management services to corporate users and consumers. government on key issues affecting the sector, the BVRLA regulates its members through a mandatory code of conduct. Peter has been heavily involved with the Association for many years, during which time it has successfully represented the interests of the industry. Great part exchange prices paid on your car and large selection of NIL deposit cars for SALE. Volvo vehicle technician Matthew Thompson at Marshall Cambridge has achieved the highest qualification in the industry after he was awarded Master Technician status. Recognised as the pinnacle of automotive excellence, would-be master technicians have to be nominated by their business and then undergo a series of exams and practical tests to assess their technical competence. The stringent tests mean only the very best technicians achieve the requisite grade to qualify as a master technician, which is also independently recognised by the industry’s body the Institute of the Motor Industry (IMI), a further reflection of the qualification’s high standing. Matthew, who started at Marshall Cambridge in Newmarket Road started his career at the dealership as an apprentice after leaving school ten years ago and is now the dealership’s only master technician. After vigorous assessment, Volvo is an approved centre for the IMI’s Quality Assured Awards (QAA) programme which means those who successfully complete the Volvo Master Technician programme receive a QAA certificate from the IMI, which provides the individual with independent verification of their technical competence. 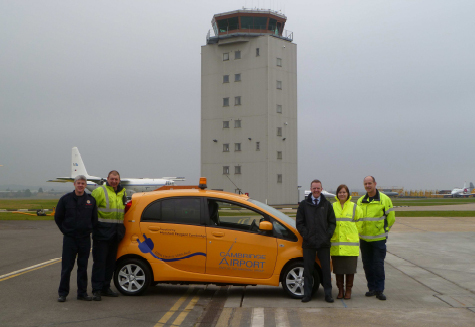 Cambridge Airport is now one of the most ‘switched on’ Airports in the United Kingdom having taken delivery of a new Peugeot Ion all electric motor car. The car will be used for a variety of general purposes around the airfield and for runs to and from the Airport into Cambridge. Marshall of Cambridge Group Environmental Manager, James Heffron, said: “Peugeot Ion is perfect for short regular journeys in and around the Airport, and as this green technology becomes more affordable and accessible, we have plans to see more electric vehicles operating within the Marshall Businesses”. The car was supplied to the Airport by Marshall of Cambridge Peugeot on Newmarket Road. The all electric car is powered by rear mounted 64bhp motor, whilst the 88-cell, 16 kWh lithium ion battery pack is mounted under the centre of the vehicle. The car has a very respectable performance with a top speed of 81 mph and 0-62 mph acceleration in 15.9 seconds. Like all electric cars the ION can be charged via a standard household electric outlet. Its battery pack can be charged in around 6 hours, after which it can achieve 93 miles of driving. Airport Director, Archie Garden, said: “The Airport has been taking a very proactive stand towards ‘sustainability in Aviation’ and with its zero CO² emissions per kilometre ‘at tailpipe’, the Ion will contribute significantly to reducing the carbon emissions from Cambridge Airport”. Welcome to the world of the New SEAT Mii. Leicester SEAT in May 2012 and will be available to test drive. A car that opens up a world of opportunities. A world where everything will seem more enjoyable: the shops, family days out, travelling to work. Having a vehicle with the latest technology, low consumption and the space to allow you to carry around all you want, will make your life more complete. The New SEAT Mii features the latest advances in multimedia, Portable Seat System, which integrates browser and Bluetooth in one device and allows you to display information on the on-board computer and radio CD-MP3 on your screen. Marshall Motor Group have set up a twitter account that automatically tweets when a new job is advertised on their recruitment system. This enables potential candidates to follow the account @motorcareers and see our vacancies as soon as they go live. Marshall Motor Holdings HR Director Carole Burman commented "Using social media to advertise our new vacancies is a natural progression for Marshall as we use social media successfully in all areas of our business. Achieving maximum exposure to attract high quality candidates is vital as it is our teams that give our business its strength to compete in this exciting market." It also includes Authorised Repairer businesses for Volkswagen Commercial Vehicles in Grimsby and Renault in Scunthorpe. Around 120 former F. Cross & Son colleagues have transferred to Marshall under the terms of the agreement. F. Cross & Son was founded in 1958 by Fred Cross and has remained a family business from that time. Marshall was founded in 1909 by David Marshall and its current chairman, Sir Michael Marshall is the third generation of the family to chair the family business. A gala dinner was held last Friday in Kings College, Cambridge for the first MAVTA awards ceremony. It was a highly enjoyable evening hosted by Austin Healey, the ex-England and British Lions rugby player. There was an extremely high standard of nominations and we were thrilled to see Tim Phillips, General Manager from our York and Hull Honda businesses win the Group award for Leadership. He received as his prize a stay at the Ritz Hotel complete with theatre package. We hope that he and Vicki enjoy this richly deserved reward. Though they didn’t win the team category, I was also delighted that Marshall Leasing team who were specially recognised for extolling our values so brilliantly when coming to the assistance of a colleague facing some very difficult times following a family bereavement. I would also like to pay tribute to all of the other shortlisted nominees who had ensured that we had a very strong representation in all categories on the evening. I hope those that attended enjoyed the evening and will be keen to ensure that they are at next year’s event which is already in the planning! On the night, we saw a high standard of nominations from our sister companies in the Group and I know that given the number of talented and enthusiastic people that we employ in Marshall we will be able to have as many, if not more great nominations when the MAVTA nomination process starts again in the summer.